Easy Dinner: Baked Lamb with Pasta and Tomatoes / Hey, EEP! Yum, yum, yum!! It's been a stressful couple of weeks with finals & life. Wholesome food is the ultimate medicine for such craziness. Comfort food means different things to different people, but this baked lamb dish with creamy orzo hits the spot for me! It's incredibly easy to make. The orzo cooks right in the baking dish along with the lamb leaving you with cheesy pasta, embedded in tomato that takes on the flavor of the meat. YUM. This recipe comes from Anissa Helou's Mediterranean Street Food book that was gifted to me by my God-mama. It's filled with many delectable things. It's always difficult to choose just one recipe to test out. 2. Pour the oil olive in an baking dish, about 9x13. Add the tomatoes, garlic and oregano and stir in 1 cup of water. Season with salt and pepper and add the lamb. Bake for 1 hour, turning the shanks every 15 minutes. 3. Add 2 cups water to the sauce. Stir in the orzo and bake for another 20-30 mins, until the pasta is done to your liking. Sprinkle with parmesan. Season if necessary. Serve. Enjoy! I have never actually made lamb. Have I been missing out? What is the taste like? Maybe I'll try this one when we get to Ohio! 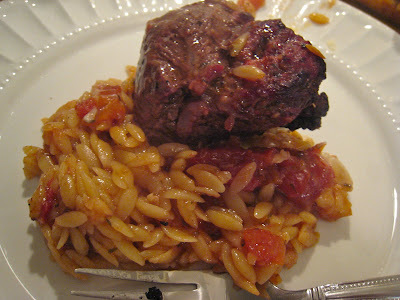 question: do you take the lamb out after the 1 hour, before u put in the orzo?